Congratulations to the finalists for the Colorado Meetings + Events' Best of Awards 2015! We look forward to celebrating with each of you at our Best of Awards on Monday, March 16 at Mile High Station, where the winners will be announced. Our sixth annual readers’ choice winners rise above the rest. Congratulations to all Colorado Meetings + Events' 2012 Readers’ Choice Best Of Finalists! We've listed the finalists in each category in random order, so don't get too excited-yet. 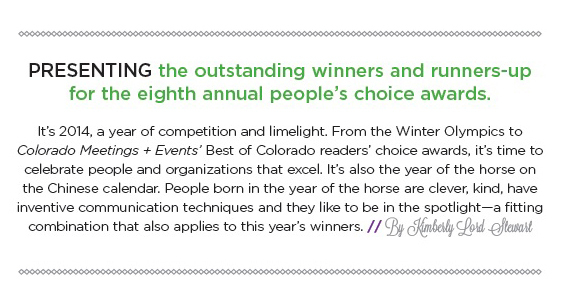 Winners will be announced at the Readers' Choice Best Of Party in March and appear in the Summer 2012 issue of Colorado Meetings + Events. Don't forget to R.S.V.P. for our event to celebrate the cream of the crop in Colorado's meetings and events industry. We roll out the red carpet for seven meetings and events professionals who have earned a salutatory nod from their peers.